A South African club has been invited to join the Pro12, BBC Scotland has learned. The Cheetahs, based in Bloemfontein, have been approached by the league, which currently comprises teams from Ireland, Scotland, Wales and Italy. The Pro12 deny extending a formal invitation, but say discussions are underway between stakeholders. Two South African franchises will be cut from Super Rugby from 2018, amid a downsizing of the competition. 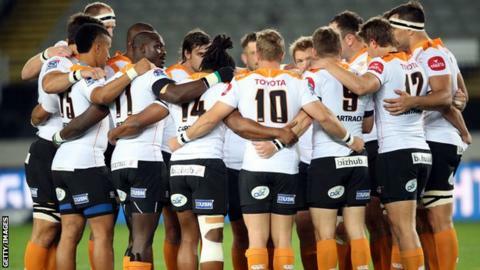 The Cheetahs and the Port Elizabeth-based Kings are widely expected to lose their Super Rugby status. The South African Rugby Union is also eager to align with a northern hemisphere tournament in future. Super Rugby features 18 teams from New Zealand, Australia, South Africa, Argentina and Japan, but will be reduced to 15 next year by governing body Sanzaar. As well as the two discarded South African sides, Australia will also lose one of its five representatives in the competition. It has yet to be confirmed which three teams will be removed from the tournament, but it is believed the Cheetahs and the Kings will be the South African sides to lose their Super Rugby status.